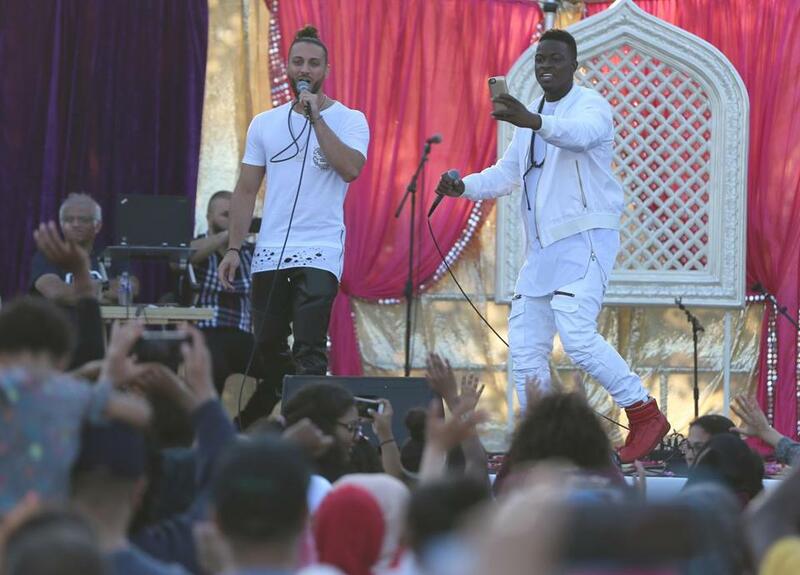 Karter Zaher (left) and Jae Deen of the hip hop group Deen Squad performed at the second annual New England Muslim Festival. Malden resident Naomi Brave came to the festival with her husband, Clay Larsen, and got a temporary henna tattoo on her hand. Festival-goers left with henna tattoos but also with copies of the Koran to read at home, with new scarves, or purses, or rugs, and often with bellies full of gyros, falafel, baba ganoush, and halal burgers and hot dogs. Brave said she returned to the festival for a second year “to learn about my Muslim neighbors, get some good food, and hear some good music.” She said she was proud of Malden for hosting the festival and for being so welcoming to residents from many countries and faiths. Like several other festival-goers, she bragged about the diversity of Malden High School, where the native languages of the students number in the dozens. For non-Muslims, like Brave and Larsen, it was a day to explore another culture. For Muslims like Souad Belkessa, it was also a chance to connect with old friends from the city’s sprawling Muslim community. Belkessa, 39, is an immigrant from Algeria who lived in Revere before settling 14 years ago in Malden, where she is raising four children and says she has always felt welcome. Belkessa said when she began wearing a hijab, or head scarf, in 2003, the community treated her the same as it had before. 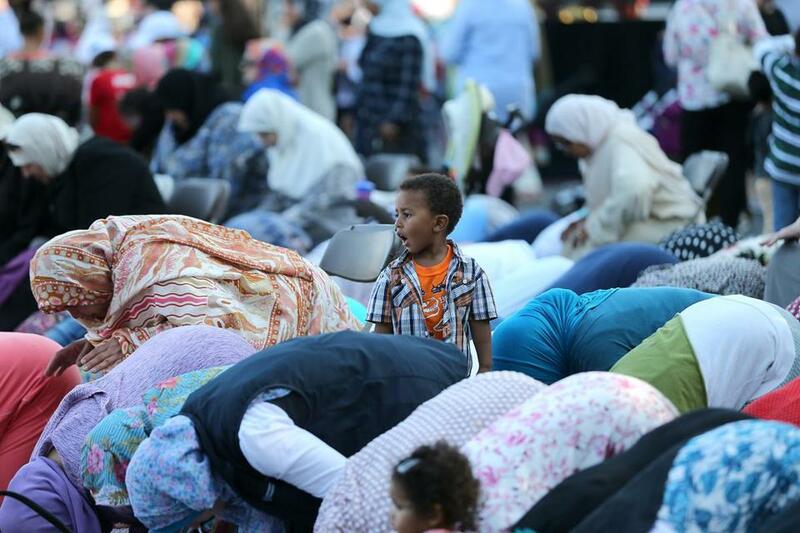 Mohammad Oubaha, 3, watched as his grandmother prayed at the festival. Weymouth resident Hajj Wafaa, 45, went to the festival to introduce visitors to Arabic calligraphy, executing their Arabicized names in elegant swoops and dashes of ink. One shirt included a cat with a red ribbon and the words “Halal Kitty” instead of “Hello Kitty.” Another shirt said “Radical Islam” and featured an illustration of a woman on a skateboard in a burka. In a wink toward the Trump administration, a red shirt said: “Make America Great Insha’Allah,” which means, “God willing,” in Arabic. On a onesie were the words “little choosa” and the image of a baby chick. The word means “baby chicken” in Urdu. “It’s just the word for ‘adorbz,’ ‘totes adorbz,’ ” Kazmi said, using American slang for “totally adorable.” Kazmi recently gave one of these onesies to a friend who told her how excited she was for her children to wear Muslim-proud clothes. Excited children could also be found at the festival’s bounce house, super slide, and face-painting table. Girls in colorful head scarves played games and chased friends around the festival or danced along with performers near the stage. His 3-year-old son’s face was covered in red paint, transforming the small boy into Spider-Man. 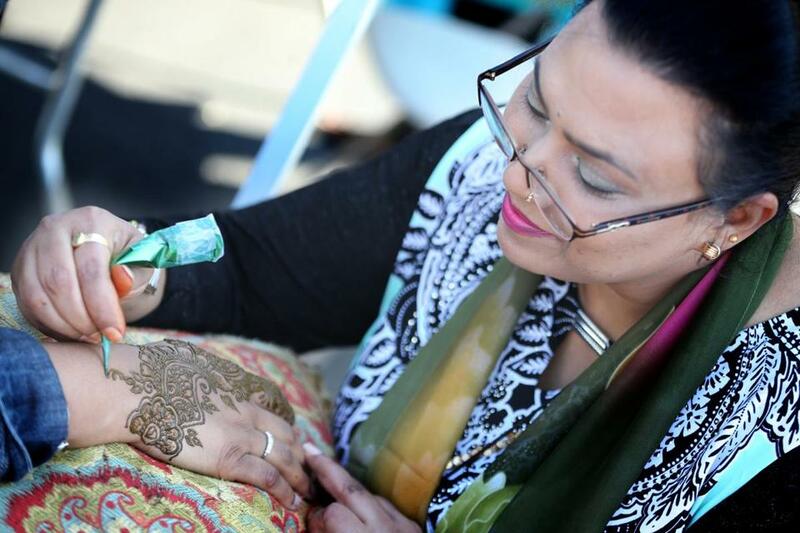 Noureen from Noureen Design in Framingham did a henna painting on a festival-goer’s hand. Jeremy C. Fox can be reached at jeremy.fox@globe.com. Follow him on Twitter @jeremycfox. Cristela Guerra can be reached atcristela.guerra@globe.com. Follow her on Twitter @CristelaGuerra.